Have you resigned yourself to never getting a good night’s sleep? Are you tired of scrolling through countless articles and “how to stop snoring” treatment guides? Can anything actually be done? The first thing to realise is that you’re not alone. Up to 30% of people aged 30 and above snore, and this increases to 40% in middle aged people. 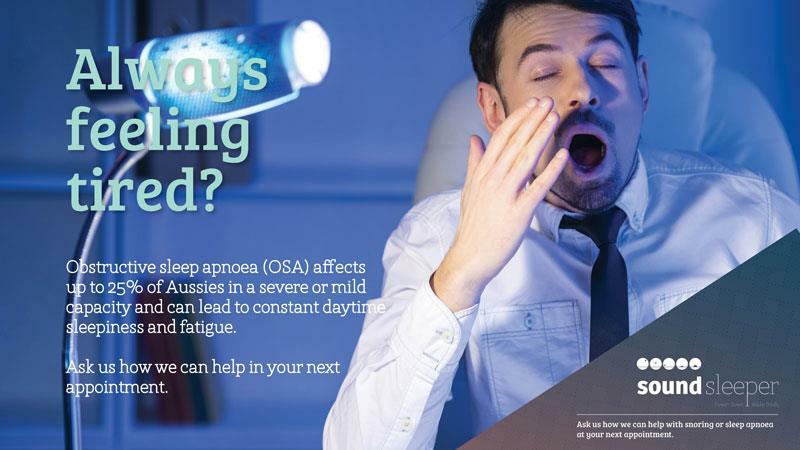 The most common of sleep disorders is Obstructive Sleep Apnea, affecting around 4% of the Australian population. That makes for a significant number of people turning up to work fatigued and irritable. Having a partner who snores through the night can’t be fun either – you’d probably turn up to work fatigued and irritable as well. It’s important to understand that just because you or your partner have a terrible snoring condition does not mean that you definitely suffer from sleep apnea. Interested in understanding the mechanics of why you’re snoring? Snoring happens when the muscles in your airway stop functioning normally, causing loud vibrations to resonate every time you breathe – this is the (undesirable) snoring sound you hear. Sleep apnea is when your tongue also falls back over the airway, blocking the flow. This results in periodic shallow breathing, and you may occasionally even stop breathing briefly. Waking your partner up each time they begin snoring is probably not the most viable of options, but that’s alright because both snoring and sleep apnea treatments are extremely simple, and don’t have to involve any sort of surgery. Let’s introduce you to Oral Snoring Devices – the easiest treatment to stop snoring and sleep apnea. These mouthpiece devices are built from your teeth impression and specially designed for your mouth. If you’re looking for an inexpensive and non-invasive snoring and sleep apnea treatment method, these dental appliances could be your solution. What else can help? Sleeping on your back increases the likelihood of your tongue falling back over the airway, causing snoring and sleep apnea. Sleeping on your side instead can reduce this likelihood and help you breathe easier, making for a pretty effective snoring and sleep apnea treatment. Special pillows can also be designed to support your head in a position that opens us nasal airways and stops snoring and sleep apnea. Clearing your nasal passages sounds like a pretty obvious treatment for stopping snoring – and it does work! Clogged and blocked noses are most likely to increase snoring, so clearing them before bed is a good idea. As you’ve probably read, lifestyle choices have far-reaching impacts on most aspects of life, including the quality of your sleep. Here are some of the other more common ways to stop snoring and treatment of sleep apnea. Exercising and losing weight, while not a sure cure for everyone, could help decrease the fatty tissue in the back of your throat and stop snoring. Even if it doesn’t, it’s definitely a great practice to start exercising regularly! Apart from the occasional after-work drink on Fridays, avoid alcohol and don’t rely on sleeping pills and sedatives – these will do you more harm than good. Muscles in the throat actually become more relaxed and contrary to popular opinion, are more likely to interfere with breathing. Smoking, obviously, irritates your nose and throat which can block airways and increase snoring and sleep apnea, so listen to your friends – quitting is really in your best interest in more ways than one! While treatment of snoring and sleep apnea share common methods, it’s best to consult a professional if you find these methods have failed. If left untreated, obstructive sleep apnea can increase your risk of more serious issues like high blood pressure, irregular heartbeats, stroke, heart attacks and diabetes. Many dentists are fully qualified and experienced in treatments for snoring and sleep apnea, and would also be able to identify signs of more serious disorders. Snoring does not have to be a lifelong problem, and your days of waking up with headaches and struggling to concentrate can end now. Considering you spend a third of your life sleeping, you may as well enjoy it! Few Tips to Stop Snoring!